Inspired by the colors of the Fantom Bohus, I dyed up some Bluefaced Leicester wool top awhile ago, and spun like a mad woman this weekend. 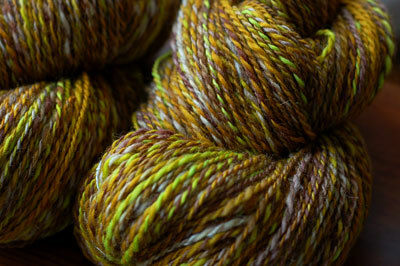 This was dyed in the oven with acid dyes and spun and plied at a ratio of 1:10.5. It’s worsted-spun from commercial combed top that I split lengthwise into thumb-wide strips and spun from the end. I was able to concentrate on spinning in the evenings because we watched two of the worst movies I’ve ever seen this weekend. Ghost Rider and Into the Blue provided me with multiple reasons to keep my head down with eyes pointed at my spinning! I stayed up way past my bedtime last night in order to finish plying. Shambles thought I was crazy for staying up so late. He didn’t even wait for me to finish brushing my teeth before running and jumping into his bed. This is “Lantern Festival”, the Hello Yarn Fiber Club’s July offering. Everyone got 5 oz. of this Corriedale top. I wanted to end the first round of the club with a serious punch of color and I’ve been so happy to hear from people who are enjoying it. Thank you! The Lazy Red-Liners are going to meet at Cambridge Common (the park), near Harvard Square around 6:30 on Monday, 7/23. Bad weather location is Dado Tea at 955 Mass Ave between Harvard and Central. Everyone is welcome, including folks not in Ravelry yet! I’ll be there with my half-ripped Bohus sweater (you don’t even want to know and I’d prefer not to think about my rookie error). The location is still up in the air. As the hour grows nearer, I’m sure the location will be hashed out. Give me a shout if you’d like to come and can’t get on Ravelry to see where to go. ETA: It looks like Dado Tea is it. 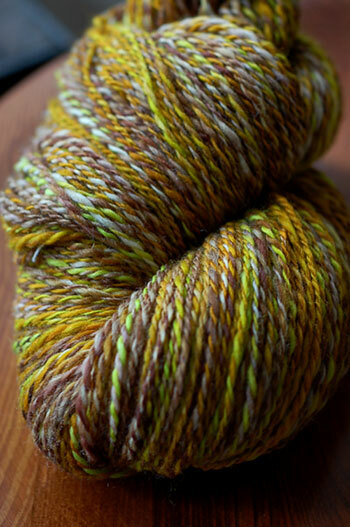 oooh – that handspun is beautiful! and that roving – such color! Fantom looks great! I got the July shipment over the weekend and LOVE the colors! So bright and cheery – I think I’ll save this one to spin during the gray of winter. I saw Ghost Rider expecting it to be bad but also thinking that sometimes movies like that can be awesomely bad. There was nothing awesome about it. I love the fantom yarn, it’s beautiful! Oh, everything is SO pretty, as always! I LOVE the July fiber! Mine isn’t here yet, but I can’t wait to meet it in person! A question for you Adrian, when you are spinning finer weight yarns, do you use the highspeed flyer on your Louet or another wheel? I’m interested in getting into some finer spinning and was looking for some opinions on the options (I have an S75 DT) and if you used/liked the flyer kit. Thanks in advance for any advice! Oooh, and we just watched Hot Fuzz last night. That was good and it managed to have mindless violence while making fun of mindless violence. That BFL is quite lovely. I really like the hints of lime green in there, it adds an unexpected Pop! I want to steal that blue faced. Or maybe have you dye some for me. :) And I love lantern. As soon as I clear up bobbins again, it’s the next thing going on. I love seeing your yarns and hope that one day I’ll break the secret code of how to read the fibre and plan a spinning project. Meanwhile I’m drooling at yours! 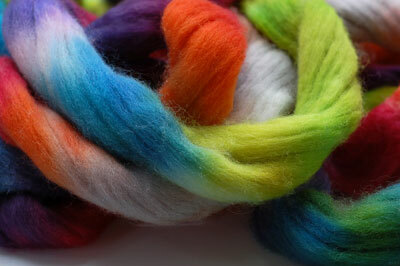 I love the BFL – both the spinning and dying are gorgeous!